Come one, come all to WRC’s next Thirsty Third Thursday happy hour THIS Thursday, March 17 at 6:00 p.m. We’ll meet at Iron Horse Tap Room in Chinatown. Our happy hours usually last 2+ hours, so if you can’t make it right at 6, chances are we’ll be there for a while. Send a message to lauren@washrun.org if you have questions or if you want a status update. WRC Happy Hour! SDR! Racing! Hats! Happy Friday, WRC! We have a few updates for you – and hope to see you soon! If you’re interested in joining a team, send an email to Julia at jtrunningdc@gmail.com. Our next Thirsty Third Thursday Happy Hour will be on Thursday, March 17. Yes, it’s St. Patrick’s Day and no, we won’t be going to an Irish bar. We’ll meet at 6:00 p.m. at Iron Horse Tap Room in Chinatown. Green apparel optional. See you then! As a reminder, all registered members of WRC will receive a hat. Be sure to come to a run to claim yours! Join WRC for our Sunday Distance Run on Sunday, March 6 at 8:00 a.m. in front of the CB2 store in Georgetown. We’ll head up toward Rock Creek. 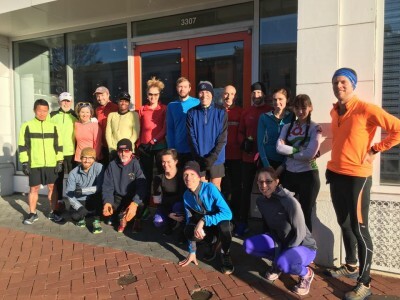 Some folks will be running the Rock Creek/Capital Crescent loop, while others will run out and back. All are welcome. We’ll meet at Dean & Deluca for coffee after the run. Remember: it’s the First Sunday of the month so be ready for a photo! We missed the First Sunday photo for February, so last week, we took a Last Sunday photo. I’ll leave you with this great shot – see you Sunday!